This is my 1936 Ford Convertible Sedan, which my family has named "Miss Smithfield." A whole page of 36 Ford convertible sedans can be seen by first clicking on the "36 Convertible Sedan Info" link at the bottom of this page and then clicking on the "All Convertible Sedans" dial link that appears on that page. On that page, scroll to bottom and click on "More 36 convertible sedans" to see the new SECOND page of these beautiful cars. I broke them into two pages in order to add more cars and also cut down on the time it takes to load each page. 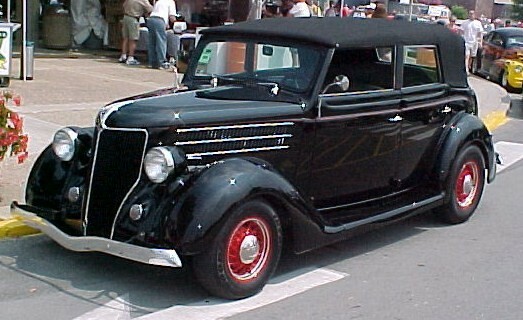 This is my SECOND 1936 Convertible Sedan that was purchased 8/2/2007 from Mike Sublett who had owned the car since 1970. It is powered by a 302 Ford engine with C4 trans. It has Mustang II coilover shock front end and custom four bar COIL rear suspension. The grey ultraleather interior looks great and the Vintage Air AC blows COLD! I bought the car and then drove it to the NSRA Nationals in Louisville, KY. Event was huge but weather was too hot to do much exploring. Mostly stayed inside and ate ice cream and spent money! Big THANK YOU to my friend, Gerry Burger, who encouraged me to buy the car. Of course, it was just a few weeks earlier that I was encouraging HIM to buy that 40 pickup he had always wanted. However I was encouraging him to buy it from ME!! First pic of the Chopped Coupe was created by AJ Fitting and shows one of the two ADDITIONAL domain names that used to ALSO go to THIS web site but is no longer in use. I've completed the fitting of 40 Chev headlights and now need to get the steel fenders on the little coupe painted. Now I'm reworking the interior and trunk to provide a storage area in the interior behind the seat and make the trunk less deep. STILL more to do but I AM DRIVING it again and it is sweet! Last pics are of my dog, "Kitty," behind the wheel of the coupe. He wanted to go to the Black Dog Garage that is run by one of his pals down in FL but we never made it... Kitty got cancer in a front leg and we had to put him to sleep 12/29/06... a VERY sad day for the whole family. He lives on in our great memories of such a gentle, loving dog. The FAT RAT, 39 CHEVY COUPE; chopped five inches, SHORTENED four inches. Powered by 454 with tunnel ram and 750 Edelbrock. Turbo 400 trans. Quick change rear end from "roundy round" race car. It really "sings." Special music for all rodders. This picture is late 1993 after initial rebuild. Please click on the link below (with a dial) to see the Fat Rat on several magazine covers. I put them on a separate page to cut down on the load time for this page. Link to TCM Studios... a picture pal's web site; worth a peek. Link to Magazine Articles, Covers, Pictures about Casteen & his cars and trucks. Hi! I'm Al Casteen and live in Smithfield, VA. I have owned and built old cars since 1968(age 19). Most have been street rods but a few have been stock. I am proud to have been a member of the Portsmouth Street Rod Association since it first started in 1974 in Portsmouth, VA. In 2002, I became an associate member of Westchester Street Rod Association which is based in White Plains, NY and was chartered in 1974, too. I've been a member of NSRA since 1/1/1975. Yeah, I SHOULD have bought the Lifetime Member deal, too! While I really like 36 Fords, I do own a pretty trick 39 Chevy coupe that was originally built by Mike Wiley in Roanoke Rapids, NC. The car was first introduced in 1980 and is known as the "FAT RAT." The car won a number of awards including Best Engineered at the Nats South AND Nats East in 1980. It was on the cover of Rod Action AND Popular Hot Rodding at the same time in 1980. I've owned the car since 1986, but I am just the current custodian of MIKE'S car. I am usually working on several projects and keep selling from an inventory of more than a few "spare" parts. I hope to share some progress, ideas, and maybe sell a few things through this site. I'm still working on the site and appreciate your patience. Suggestions are welcomed. Thanks.......................................... NOTE: You can link to a "Gas Cap Tip" page at the EXTREME lower right of THIS page(sorry for the need to scroll right). Check it out. It is great for saving paint on your car/truck. Please take a moment to check out the other of this web site that can be accessed via the links below. You'll have to use the link LISTED ABOVE to see the page that has the magazine cover pictures of the Fat Rat. My dog, "Kitty," and my truck, "Bullet," are on the projects page. The stuff for sale page has been expanded and there now is a WHOLE page for Guests AND TWO pages of JUST 1936 Ford Convertible sedans. 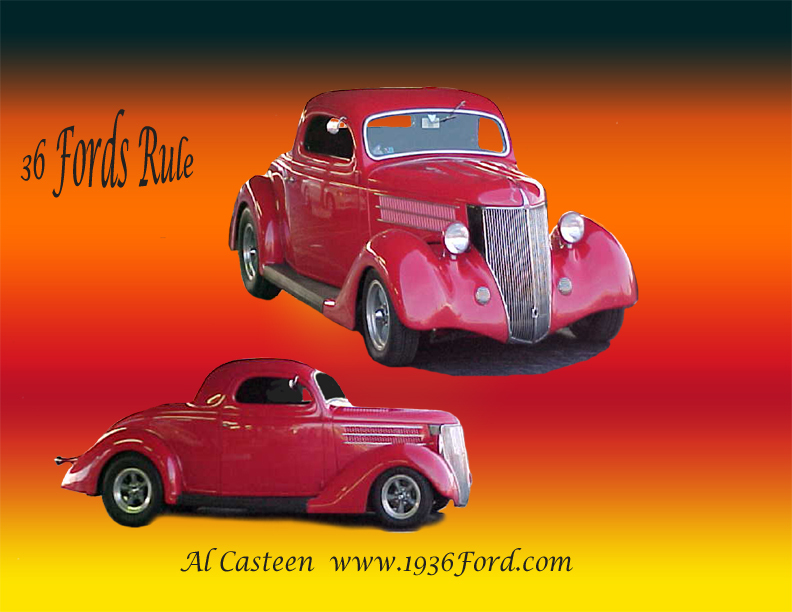 We now have a new "40 pkps" page that features my 40 Ford pickup nicknamed "Bullet". The editor of Rodder's Digest magazine recently extensively and hilariously reviewed the dashboard in "Bullet" in his editorial in the Dec 2005 issue which has a yellow 35 Ford cabriolet on the cover. Try to locate a copy for humorous observations on driving an old pickup. He also had a few comments about the OWNER! IF you can't find the magazine, click on the button above for magazine articles on Casteen, etc. Be sure to check out all NINE pages of the web site. I bought a SECOND 40 pickup that is a street rod in June from Tom Trovato in Wmsbg, VA and we are STILL friends even though it left me TWICE with electric fuel pump failures!! The WIFE was ON BOARD both times!! I now carry TWO backup fuel pumps!! She STILL likes the new truck and wants to ride in it, too!! THAT is a surprise! I'm wondering what she wants. 9/16/06. Elec fuel pump failed again with my granddaughter, Savannah, on board. She said, "Good, Dandy, now I can help you fix it." I LOVE her attitude. "We" did fix it and drove it home but I revised the whole elec fuel pump setup on the pickup to have TWO fuel pumps, an EXTRA clear filter, a fuel pressure regulator, and a fuel pressure gauge. I also CHANGED FUEL PUMP BRANDS to Borsch. Hopefully, if the fuel pump fails again, all I'll have to do is switch the power lead to the other pump and drive on home. I prefer to do my fuel pump maintenace at home and not on the side of the highway. Replaced rear suspension and rear end in red pkp by 12/7/06. Rides MUCH better. 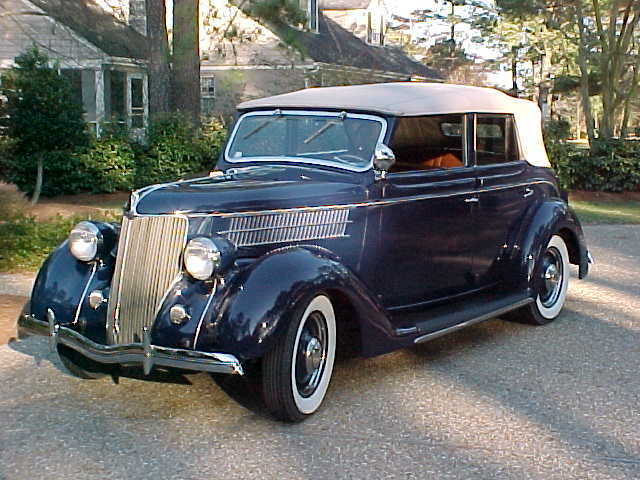 Also added some more 36 Ford convertible sedans to our 2nd gallery page. New 40 Ford black pickup purchase in March 2007 on 40 pkp web page, Check out the new 36 convertible sedan. I sold the red 40 pkp to Gerry Burger in July 2007. I ordered a new Heidts Superride 2 front end for the black convertible sedan at York, 2008 and finished the installation in October of 2008. The Fat Rat was pressed into service to take me to York in 2008 and did great and the AC was cold. Sold the black 40 pickup in January 2009 and bought new chopped 40 pickup in March 2009. Have since painted it (in epoxy primer), changed the steering column and rewired it and removed the leaking remote oil filter. Drove it to York in 2009. I've resumed work on building my 40 pkp with the front clip from a 1936 Ford CAR. It started quickly on the first attempt on 12/23/09 and I DROVE it out of garage on 12/31/09! You can check the progress on the "40 pkps" page by clicking button at bottom of this page. New pickup got exhaust system at Automuffler King by Keven Hedrick on 2/26/10. It is MUCH quieter than the open headers! More or less completed the "36 Fordy" (name for 40 pkp with 1936 CAR frontend) in time to drive it to York in 2010. Bought a 40 Ford standard coupe powered by a 1955 Desoto Hemi 9/11/10 and have since replaced the rearend using CE kit and switched to 5 spd trans from an S10. I completed the coupe enough to test the trans in April of 2011. 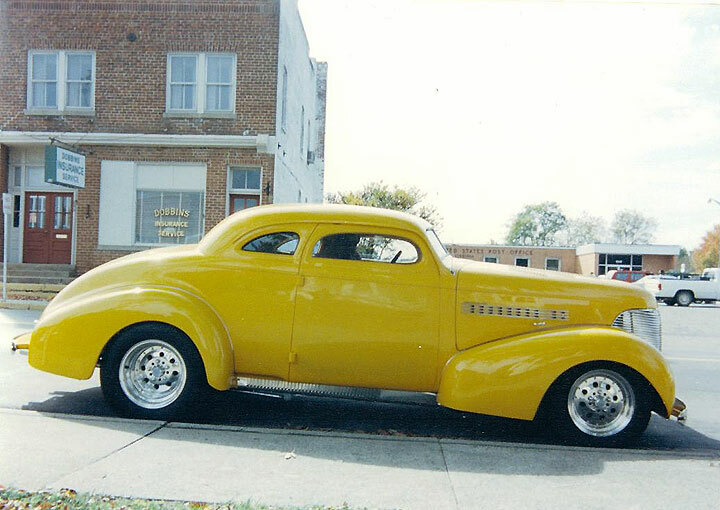 The 40 Ford hemi coupe has moved to NC in December 2011 and was replaced with... what else? ANOTHER 40/41 Ford pickup project with "some assembly required!" 2012 saw the addition of another 40 Ford pickup that is powered by a flathead Mercury engine. We also took over custody of a 1932 Ford A Gasser from Georgia that had a 43 year nap in a chicken coop before it was brought roaring by to life by Mike Thompson in Washington state. In 2013, we added a flathead powered 1936 Ford cabriolet to the collection that we've already updated to 12 volts and added turn signals. And, of course, we added another 1940 Ford pickup project; this one from Georgia. In 2014, I started the year by buying a third 1936 Ford cabriolet but this one was already updated with a wicked sounding small block Ford engine, automatic, parallel rear springs and Heidts independent front suspension, and Vintage Air. Then I began sharing my treasures with others by letting the flathead powered cabriolet go to a good home in Ohio; the Mercury powered pickup went to NJ; the 32 gasser went to NYC, then Los Angeles, then maybe Tokyo! The chopped 40 pickup went to PA and I sold the 40 pickup project from GA to a fellow here locally that has gotten it together and is driving it now. In 2015, just when I was feeling so well about thinning the herd and proud that I was exercising such discipline; I ran across a steel 32 Ford three window coupe that I could not pass up at the York, PA Nats East! So much for discipline! Here's the steel 32 three window coupe. The metallic red paint sparkles in the sun. I took over custody from Skip Walling who had owned the car since 1972 and was just completing a two to three year rebuild of the car. It is powered by a TPI 355 Chevrolet engine with 350 trans. It has Heidts Mustang II coilover shock front end and custom narrowed Corvette rear suspension. The interior needs to be completed but the Vintage Air AC blows COLD! I bought the car and then drove it home from Lincoln University, PA. It had 10 miles on the odometer when I left!! Skip said it would make it and it covered the 325 miles without incident.